Elk Ridge Fixed Blade Hunting Knife has a sharp 2.6 inch 3cr13 steel blade and comes in a nylon sheath. 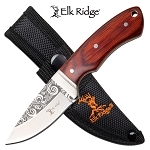 Elk Ridge fixed blade knife is a very good hunting knife. These knives are made light weight and solid. The stainless steel blade of this knife is very sharp. The knife is 6 inch in length. The blade is 2.6 inch long with etched damascus pattern. The 3.4 inch handle is made from black pakkawood. Hunting knife comes in a nylon sheath for easy carry.